We just got back from Washington D.C. where I enjoyed four memorable runs. Shown above is one of many Martin Luther King Jr. quotes chiseled into the wall surrounding the memorial statue. I was reminded of other memorable words worth reflecting on this New Year’s eve. A poem by Rumi, dedicated to my husband. Wishing you and your loved ones, a peaceful, joyful and healthy New Year! Categories: Exercise, Marathon, Masters Running, Poetry, Running, Travel | Tags: Exercise, Fitness, health, Marathon, Masters Running, Running, W | Permalink. Oh, and did I mention that I ran a marathon a couple of weeks back? I’m on the mend from the disappointment of my second-slowest marathon time since my first marathon back in 1981. At some point I hope to blog about it but I’m moving on and enjoying a lot of very short runs as part of my recovery. 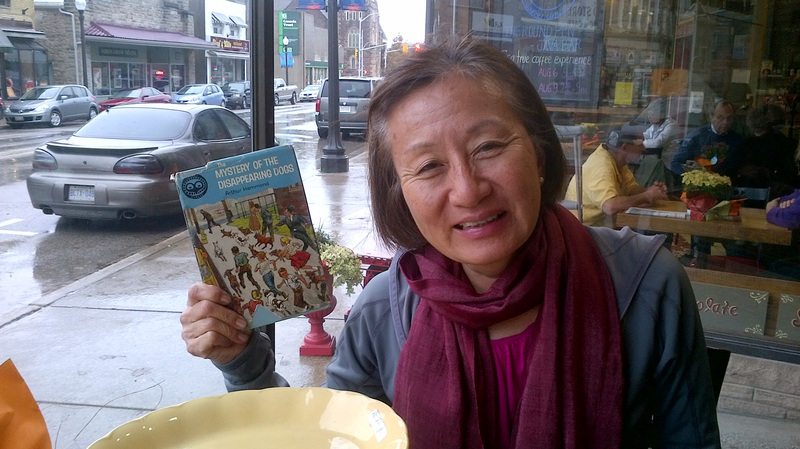 We just spent three days in Fergus in small-town Ontario and enjoyed a lot of R&R at a local B&B. 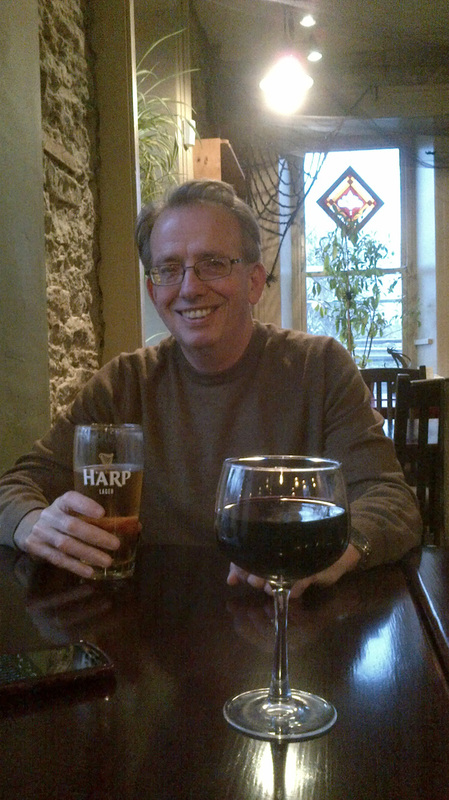 Fergus Brew Pub – Sante! It was a rainy time and we decided to skip our planned three miler on Saturday. I was ready to skip running on Sunday but got out the door thanks to my husband. 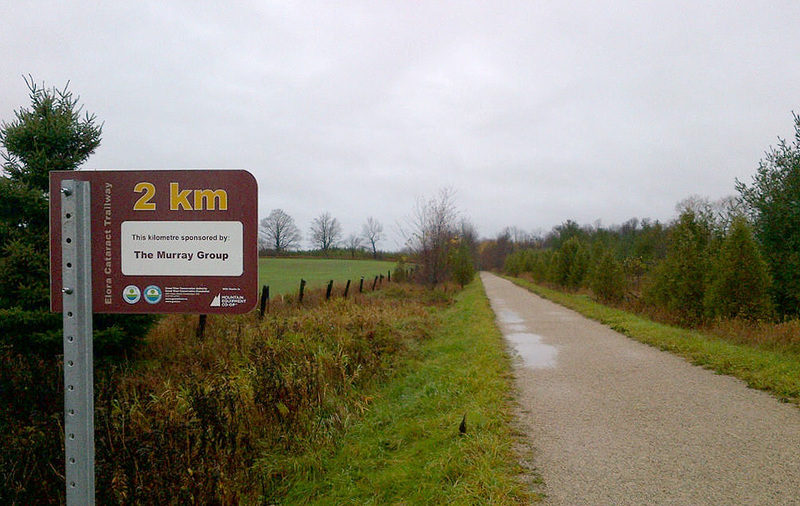 He had looked into the local trails and led us to the trail-head of a rail path which runs from Fergus to Elora. I carried out my plan to run a modest 20 minute tempo workout within a 5 miler. In spite of the light rain, I felt pretty good and was tempted to extend my tempo run. Erring on the side of post-marathon recovery, I stuck to the plan. I took a full five days off running after the marathon BUT I am trying to salvage a modicum of fitness to run a masters cross-country meet on November 11th. My strategy is to keep my runs very short and do some minimal tempo running. In addition to the five days off I ran three miles, twice, for a total of six miles my first post-marathon week. My longest run so far has been five miles. I’ve been enjoying catching up with friends and getting out and about. Last week we attended the final 2012 Massey Lecture at Koerner Hall, given by Neil Turok. Last night I saw Otto Preminger’s Bonjour Tristesse from 1958 at the Bell Lightbox and I’ve been getting a bit of reading in. Although my current read A Song for Nagasaki while inspiring if not life-changing, is heavy going. Tomorrow we are going to see Betty Lavette at the Wintergarden Theatre. We saw her earlier this year at the Portland Blues Festival. Fergus was exactly what we were looking for. It is a simple one-main-street-town with limited choices of what to do. We really enjoyed the fall fair at a local church, picking up books, dishes and a parsons bench. 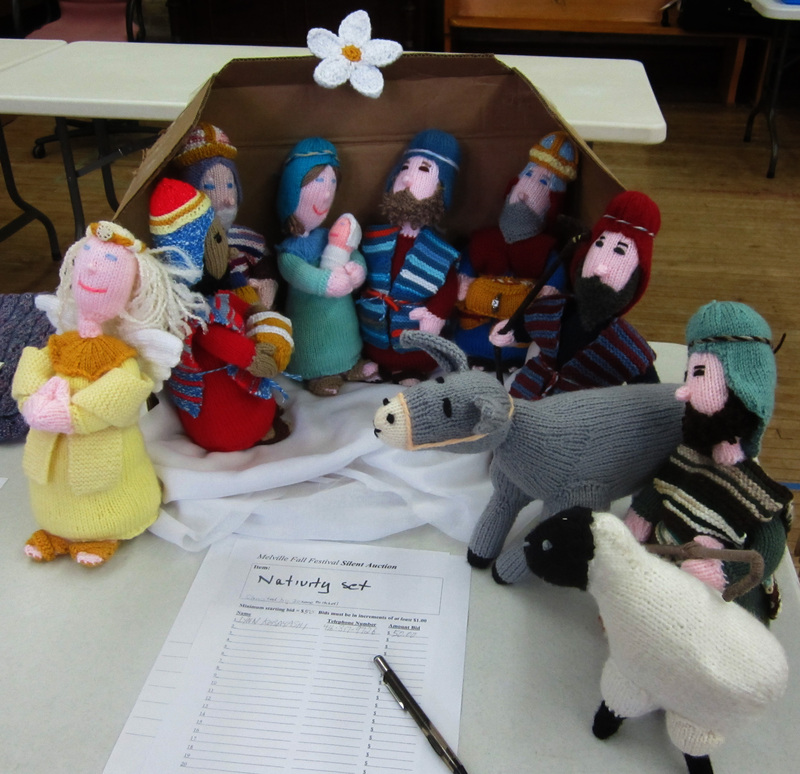 I was also the winning bidder on the nativity scene shown below 🙂 We also checked out a couple of flea markets, ate at an Indian restaurant, a creperie and a brew pub across the way from our B&B. Getting back to the marathon, there is a whole other very happy side of the story which is a about my “other team” but somehow it seems too long a tale to tell as I rush to complete my second post of the month. Two posts a month is my minimum and well, it IS the 31st. While we were away we found out via Facebook that our son and his friend who lives with us were holding a Halloween party. 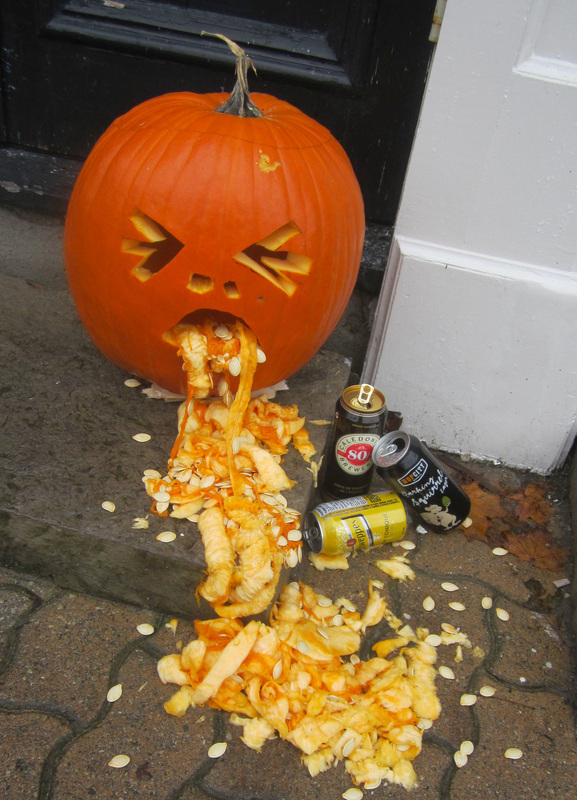 We hoped the party goers did not get carried away like this pumpkin we spotted in Elora on Saturday. Happy Halloween! Categories: Exercise, Film, Fitness, Marathon, Masters Running, Running, Toronto Marathon, Travel | Tags: Exercise, Fergus, Fitness, Marathon, Masters Running, Ontario, Running, Travel | Permalink. Back from a three city jaunt to Kingston, Quebec City and Ottawa with good running in all three cities. 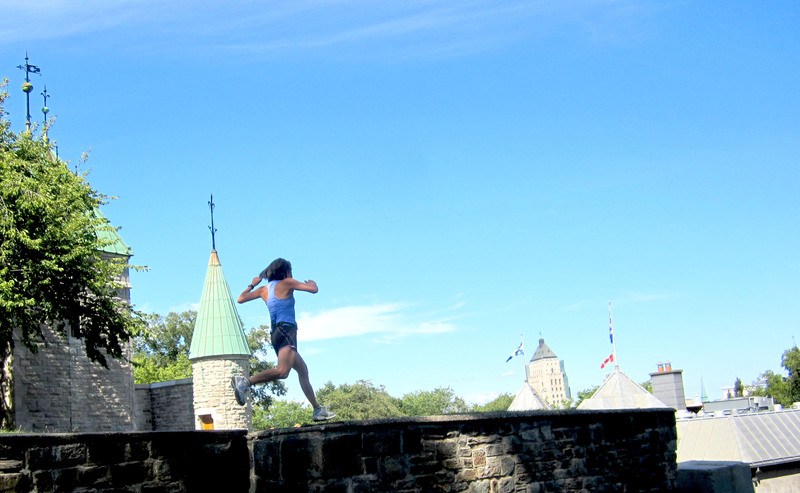 After tackling the nearly 400 step Cap Blanc staircase going from sea level up to the Plains of Abraham, a bit of research revealed that there is a race called the Défi des escaliers de Québec or the Quebec City Staircase Challenge. This stair marathon involves running up and down nearly 30 staircases for a total of more of 3000 steps over 19K. Imagine that! 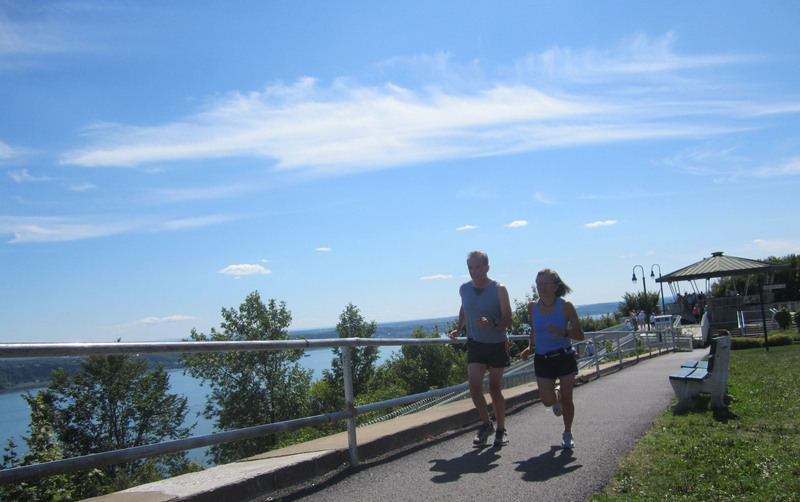 For regular runs, one can choose to run along the St. Lawrence for many miles on a gently rolling course or through the more challenging hilly terrain of the Plains of Abraham. My longest run in our five-day stay was nine miles along the river. Our hotel in Kingston overlooked Confederation Bay and the path in front of the place was part of an 8K long (albeit a somewhat circuitous) network of various waterfront pathways with a view of many windmills. The highlight of my three Kingston runs was an eleven miler with tempo sections. It is the fourth consecutive August that we have been in Kingston at the end of August but the first time that I ventured so far out along this particular route, having previously run through the army base. The down-side of those runs were the many unleashed dogs on the residential properties. The best runs of all were in Ottawa. 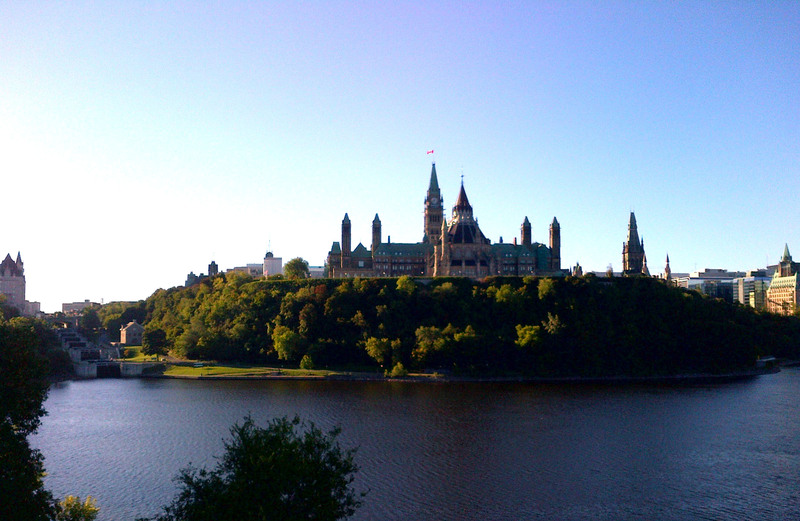 I heard rumours that one of my favourite paths, behind the Parliament buildings had been closed down. I was thrilled to find out that it was open and ran this beautiful Ottawa river path, through Majors Hill park, over the Alexandra bridge to Hull, past the Museum of Civilization and then back to Lebreton Flats in Ottawa. We lived in Lebreton Flats for a couple of years during our five years living in Ottawa. Since then the War Museum has opened and with this have come many improvements to the path that runs by it along the Ottawa river. The weather was a wonderfully cool 6C when I started and around 15C by the time I finished my 12 miles with a tempo section. This route is one of my favourite urban routes in Canada. A feature of my runs in all three cities was listening to the audio book, Your Brain at Work by David Rock. which explores the latest in neuroscience and busts many a myth about the capacity of our brain to multitask. Some of the research cited would support my sense that creative thoughts while running are easier to come by for the long-time distance runner, for whom running is a second-nature, auto-pilot activity. 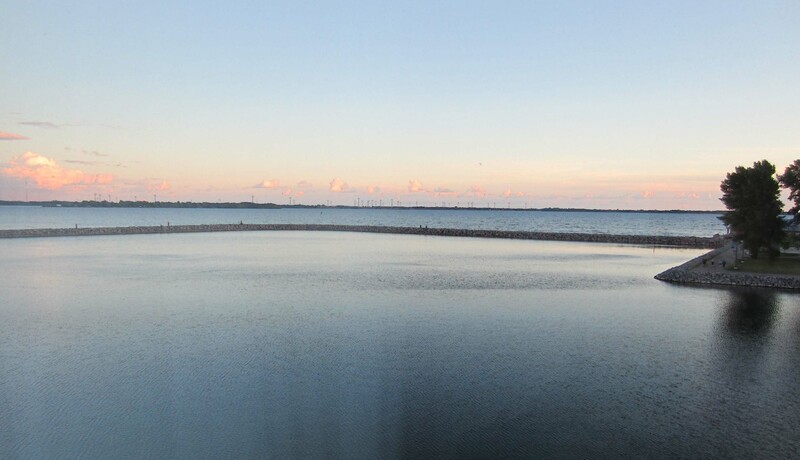 I also enjoyed not having to focus on finishing my run at a certain time which set the the stage for dreamy, lost-in-my-thoughts and very relaxed running. Of course this reduced urgency is only possible if your traveling partner also happens to be your best cheerleader and favourite running companion. Categories: Exercise, Fitness, Health, Marathon, Masters Running, Running, Travel | Tags: Exercise, Fitness, health, Marathon, Masters Running, Running, Travel | Permalink. 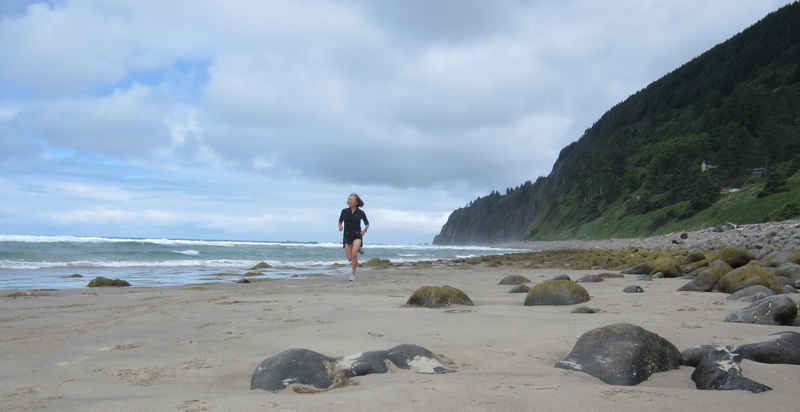 Manzanita, Oregon, two hours from Portland and a three-night stay with three morning runs. 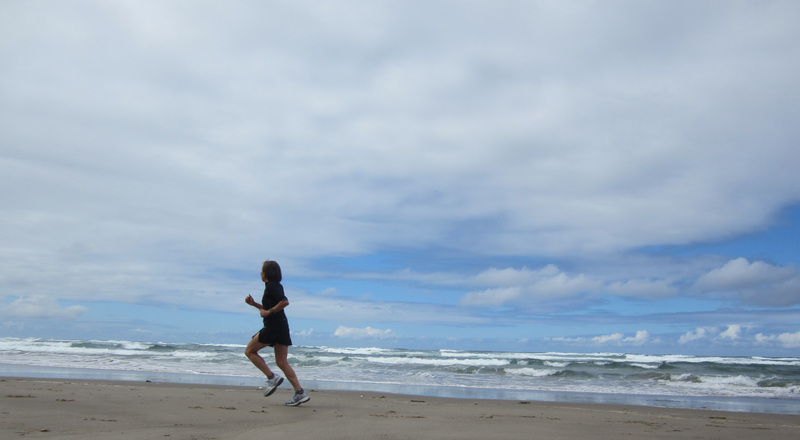 Manzanita, Manzanita, let me count the ways I love beach running. I am a daily runner so any place that has great running makes for a great start to my day as a tourist. We stayed at the the wonderful Inn at Manzanita just a block from the beach. Two years ago we spent eight days in Tofino, British Columbia on Cox Bay which I thought quite heavenly with its cozy and quiet 3/4 mile beach. 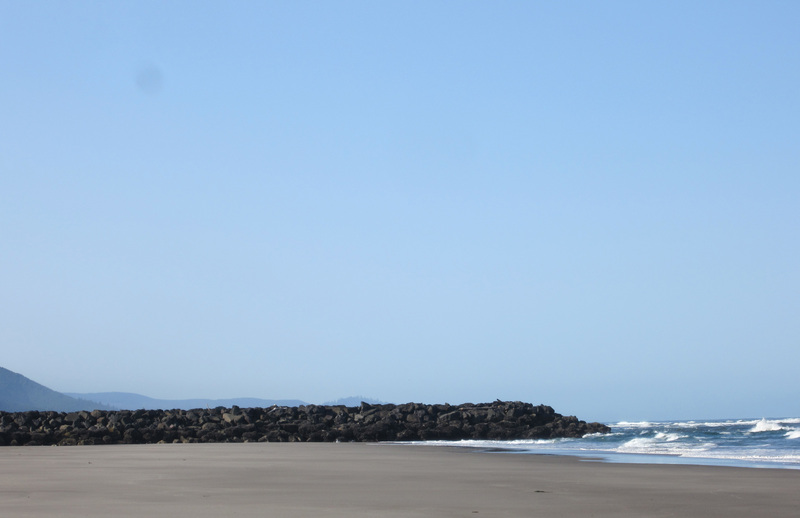 The beach at Manzanita is billed variously as being as little as four miles but up to eight miles long. 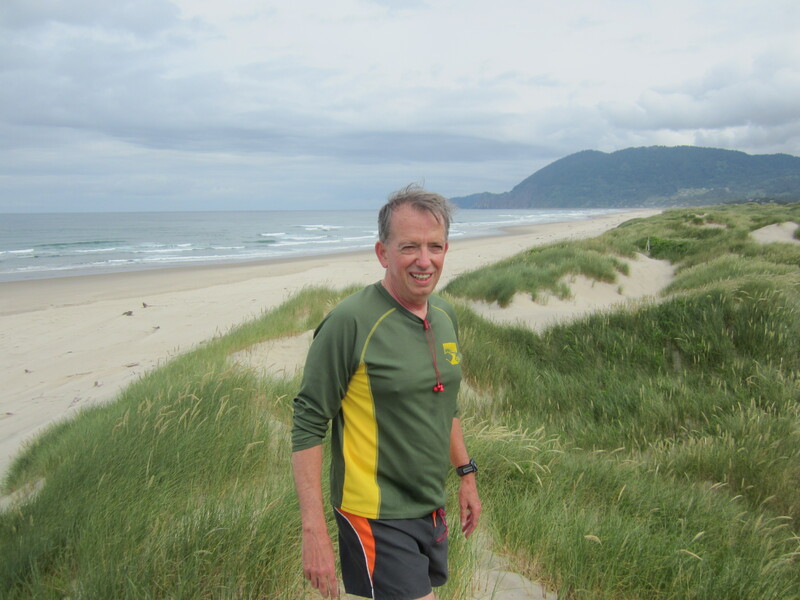 Categories: Exercise, Fitness, Marathon, Masters Running, Running, Summer Running, Training, Travel | Tags: Exercise, Fitness, Manzanita, Marathon, Masters Running, Rave run, Running, Training | Permalink. The week leading up to our getaway was busy with work deadlines, a visitor and preparations for some painting at our home. Thankfully, our son and our roommate Alain took care of moving the furniture from our guest room and bedroom in our absence. We’ve been away for just over a week and spent three days visiting with my husband’s 96 year old dad. His dad is under the watchful eye of his son the rehab med doctor and continues with a weight lifting routine of many decades. From Edmonton we took the 100 minute flight to Seattle and stayed at the Sorrento Hotel where we were the lucky recipients of a fabulous room upgrade. At check-in, we were offered the chance to upgrade to a suite for a small increase, which we agreed to this but checked to make sure that our room had a bathtub. We’ve discovered in our travels that increasingly, hotels that have undergone renovations oftentimes have only spa-style showers. And, indeed when we found that our suite only had a shower so we asked for another room. This error was corrected in grand style as we were given a room that was three times the size of the tub-less suite. We are sorry to have inconvenienced you. Please accept our apologies. The concierge told my husband that this corner suite was once occupied by Francis Ford Coppola. He also said that it was used as a set for “Sleepless in Seattle” to mimic a Manhattan apartment. Thus enjoying great hotel coffee with our laptops perched atop a large round, wood table, set in a very large bay window area, with a tiny bit of waterfront peeking through tall buildings has become a memorable urban holiday moment. 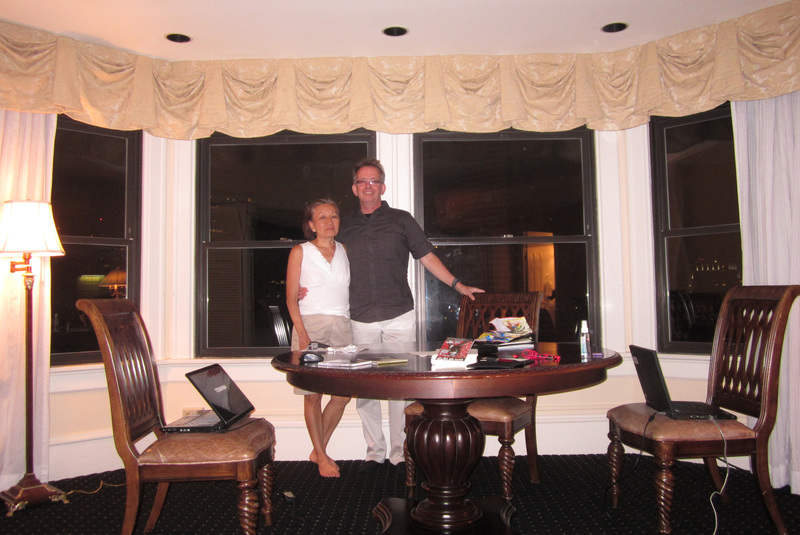 The suite included a large bedroom, a large wooden bar, an office area and a living room area. The open style lobby-bar area was extremely inviting but we never did check it out, due to the excessive comfort of our room. The only down-side to this luxury was the worry that our tipping was not as generous as that of Coppola. When I asked about running routes at the front desk, the young man who checked us in admitted that the running in downtown Seattle is not great. 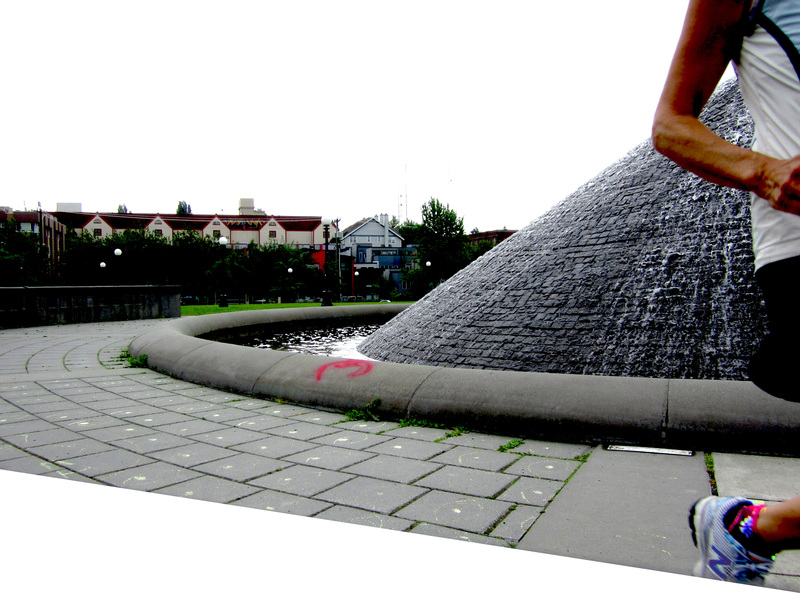 My vision of a scenic waterfront running path did not materialize. 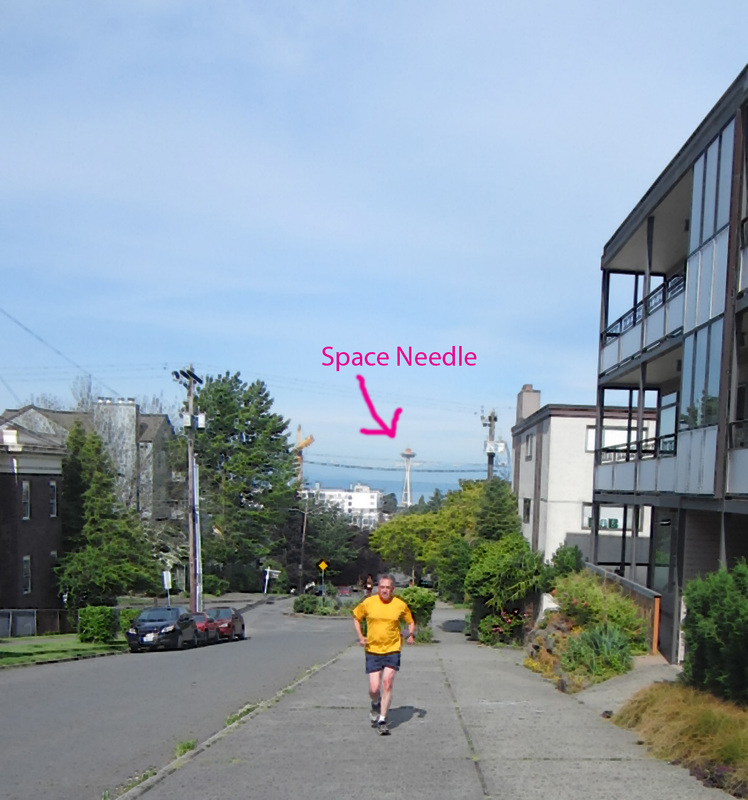 He pointed us towards Volunteer Park as preferable to the waterfront. I’ve heard that the Seattle marathon is hilly, but the reality of hills only sunk in on our first short run of four miles. Not great for my husband’s knees but it did lead me to finally use the googlemaps pedometer elevation function for the first time ever. Volunteer Park is home to the Asian Art Museum. It is not a large park with a running circumference of about one mile but it is lush and has well-maintained washrooms. The residential areas surrounding the park are very well treed, with beautiful gardens and colourfully staid facades that matched the Seattle of my imaginings. The hills in some of these residential areas seem frankly, improbable. 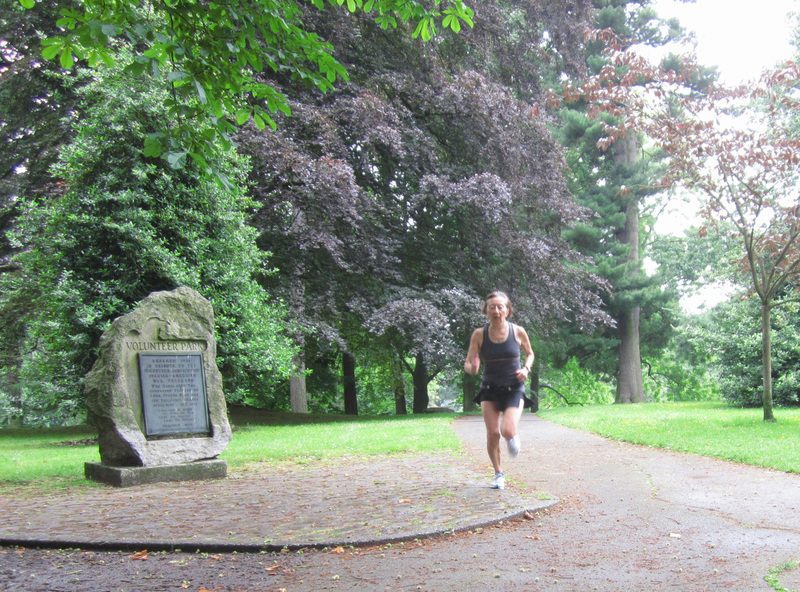 In doing some research on Galer Street, which seemed one of the steepest hills I’d run, I found it listed on a blog which offered advice on training for hiking in Nepal I ran up this hill after exiting Washington Park, home to Seattle’s Japanese garden. 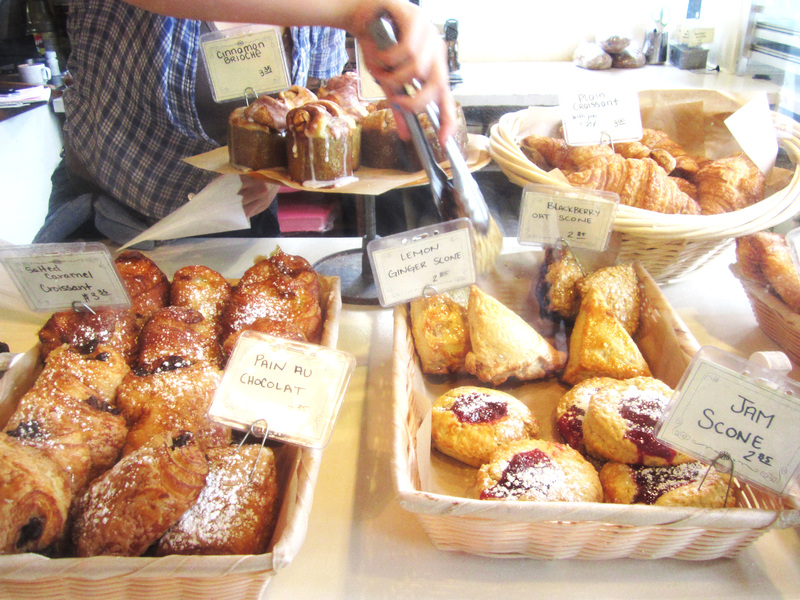 Three of my Seattle runs ended at Sugar Bakery and Cafe just around the corner from the hotel. And the treats were sweet and a cut above the usual including; salted caramel croissants and blackberry oat scones and supremely moist carrot, walnut muffins. 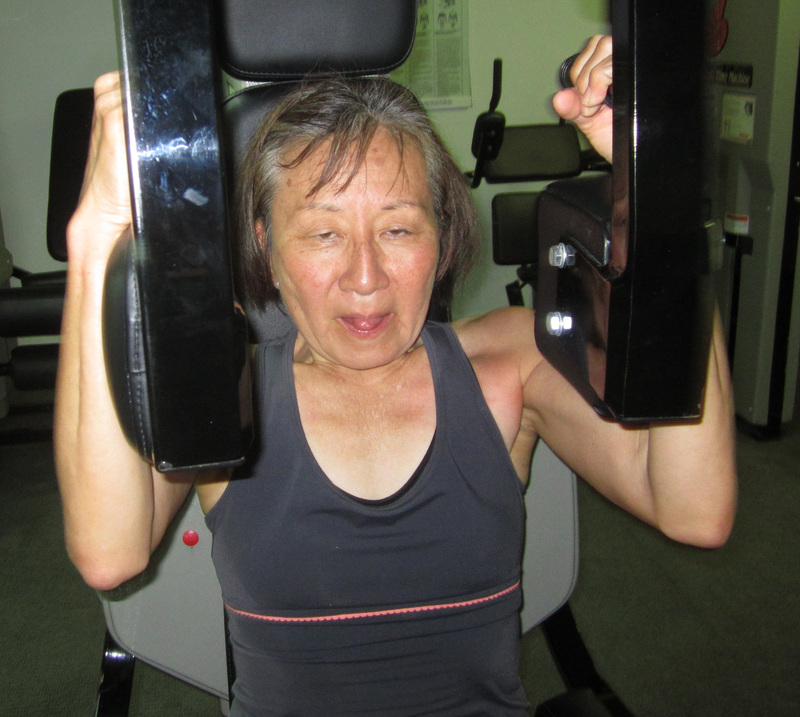 I ended one run in the fitness center to maintain the momentum of my weight training regime. My husband joined me for his workout and took two photos of my routine, one dignified and the other not so dignified and possibly hilarious. 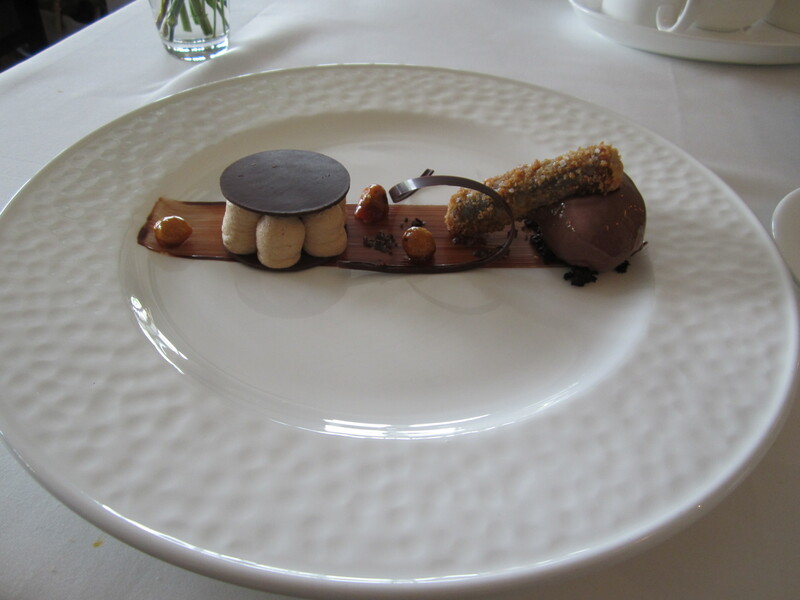 Apart from the hills, a highlight of our Seattle story was very much about our stay at the Sorrento. The crowning moment of the energetic and superb service at this hotel came as I ran up to the main door at the end of one run and wondered what the doorman was doing as he quickly ducked behind a curtain by the lobby door. He emerged with bottled water which he handed off to a grateful me. One item for the to-do list: Write a positive TripAdvisor review of the Sorrento Hotel. Categories: Exercise, Fitness, Food, Hotels, Marathon, Masters Running, Restaurants, Running, Travel, Treats, Weight Training | Tags: Exercise, Marathon, Running, Seattle, Sorrento Hotel, Training | Permalink. 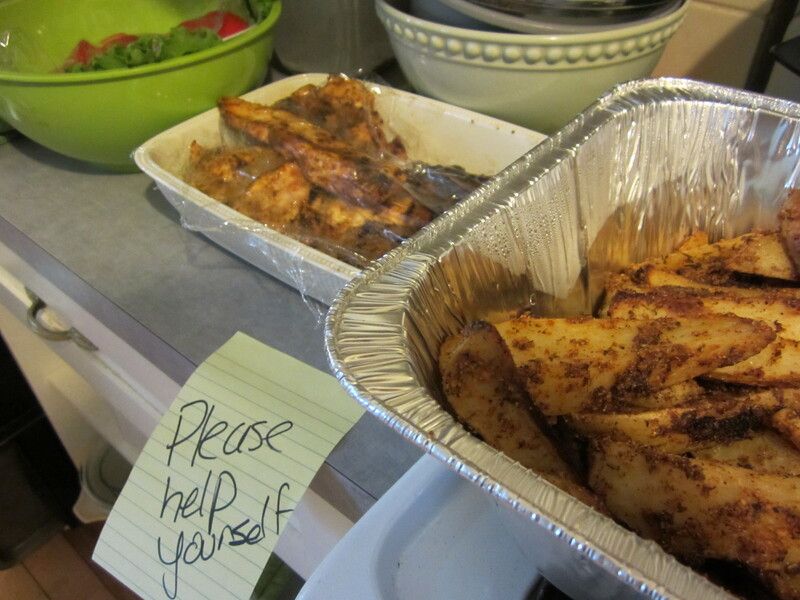 I’ve only blogged once in May due to ongoing busyness and a backlog of chores. 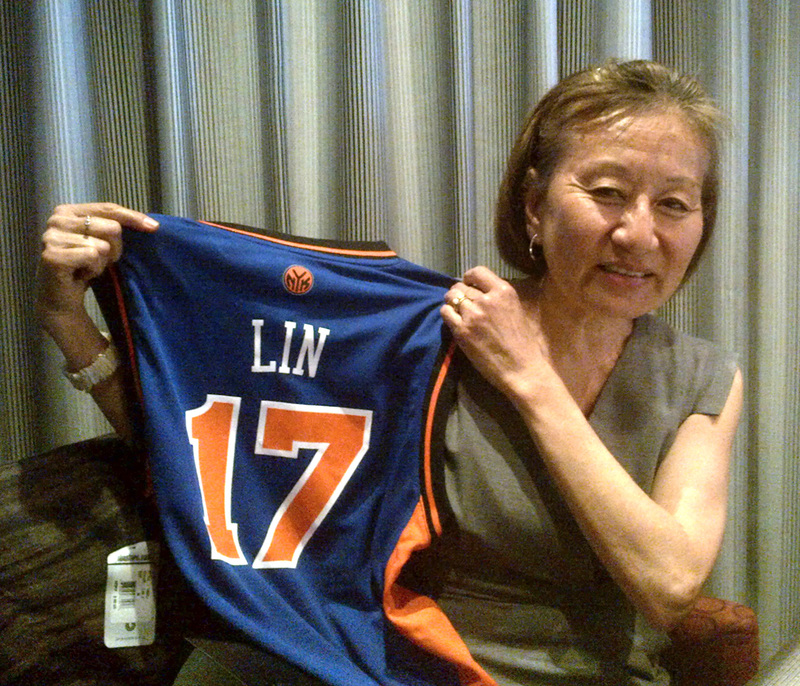 A major highlight was Mother’s Day brunch at the InterContinental Yorkville where I received a Jeremy Lin jersey and consumed a dozen oysters among other things. Another high point was taking my parents to Auberge du Pommier for lunch as a late Mother’s Day and early Father’s day outing. So I have been running long, or at least long enough for 5K training. After racing indoor track in February and March and then 5K and 10K in March and April, I felt I had reached a bit of a plateau so I took three easy weeks which coincided with my busy period. After that I hit the track and was pleased that our track repeats were on the short side. The past three Saturdays I’ve done three decent longer runs at a faster-than-usual pace. I’ve been having trouble sleeping in the past year or so, so I’m not as eager to head out super-early on Saturdays despite the great feeling of finishing 10-18 miles by mid-morning. The body will not properly absorb training without a good supply of deep sleep. I ran with a teammate a few weeks ago, who normally would be too fast for me but as he was recovering from the Boston marathon, sharing a run was doable. 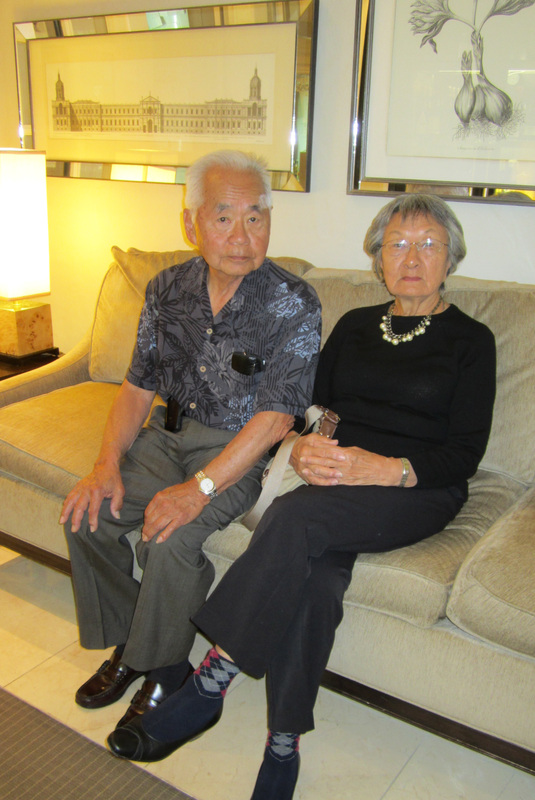 He told me that he remembered my name as the woman in the 50-54 category who was faster than him in one of his first half-marathons when he took up distance running six or seven years ago. He told me that as a young runner his benchmark had been that he was always able to finish ahead of girls his age. So he was startled to discover that a woman ten years his senior beat him in the half-marathon. He was also startled when I told him that his easy, recovery pace was putting me into the threshold heart rate zone as we ran. Ah, I was so much faster then, I’m older than that now. Another Saturday I ran with a teammate who is very new to running and has run excellent times for his category of 60-64. At our pub night a few weeks ago, I was astonished to discover that the farthest he had ever run in training was 12K. Following our conversation he ran 17K on his own and then ran 16K with me the week after. Last Saturday a friend, who now lives in Regina dropped in to join the usual Saturday run crowd. What a treat to catch up on the run. The last time I saw him was last year when he lived in Ottawa. 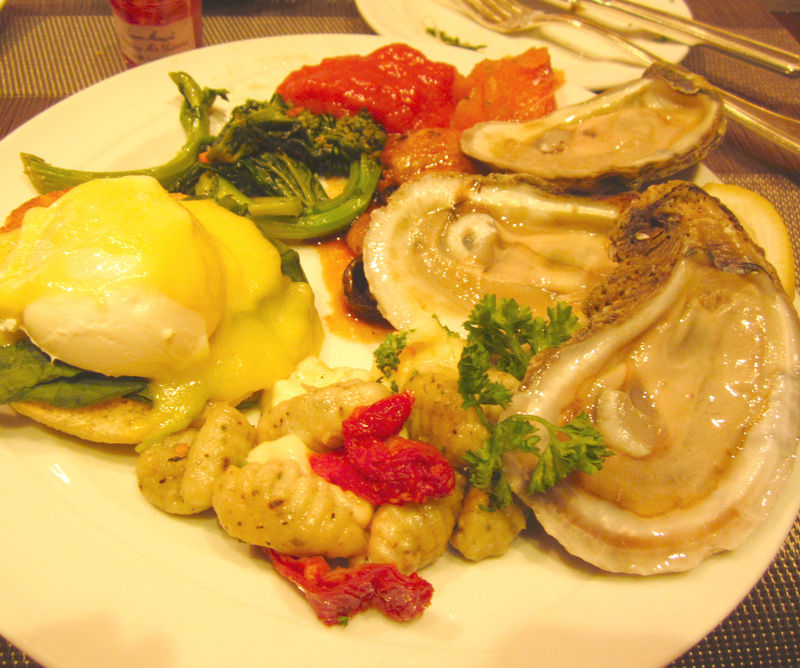 We had breakfast at the Chateau Laurier which is perhaps more of a treat than a hard 13. 5 miles run. I was having a hard time sleeping and woke that morning at 4:30 a.m. I left for the run at 7:00 a.m. It felt fairly hard and I was bagged when I got home, taking a cat nap shortly after. In the afternoon I napped from 1:00 p.m. to 3:30 p.m. My recipe for a sound sleep – wake early, run hard, nap . . . hmm. There must be a better drug-free way to deep sleep. One reason why the run felt hard was that on Thursday I had a great track work out of 8 x 300 meters. I ran the final 300 in 56 seconds! Not bad for an aging racehorse. I’m gearing up to run a couple of 5K’s in June. I think I’ve got the speed honed and will concentrate on speed-endurance for the next couple of weeks. I’ve started back to my weight lifting routine and as is always the case upon returning to this routine of a few decades, it feels great to flex those muscles. My goal for this training cycle is to go under 21 minutes. Weather will be a factor as I do not run well in the heat so cross your fingers for cool June mornings. 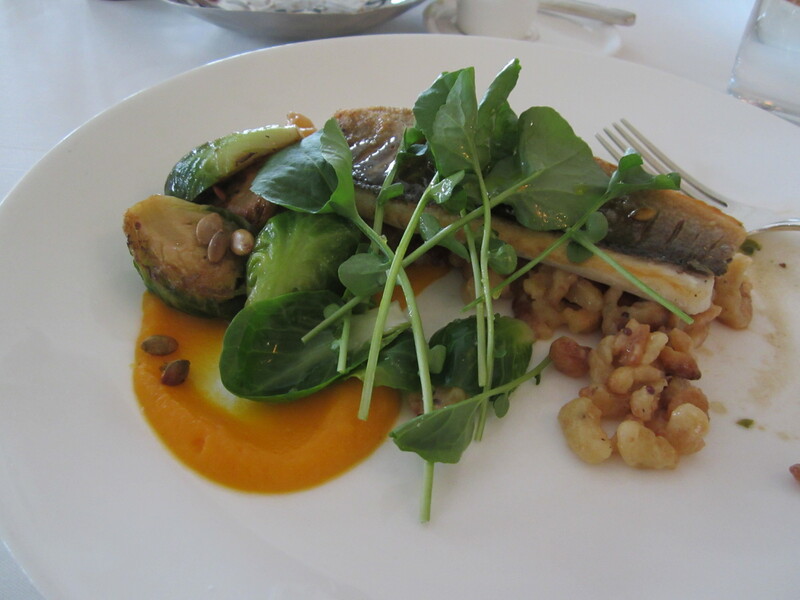 Sea bass and best Brussels sprouts ever! Categories: Exercise, Family, Fitness, Food, Hotels, Marathon, Masters Running, Restaurants, Running | Tags: Exercise, Family, Fitness, Food, health, Marathon, Masters Running, Restaurants, Running, Training | Permalink.